What constitutes an effective leadership presence and how does one portray such a presence? How does one build a unique personal brand and tell a compelling signature story about one’s values? How does one effectively lead in diverse settings and forge powerful networks? These were some of the topics explored by the 2018-2019 Women’s International Leadership (WIL) Fellows over a November weekend in Fall 2018. 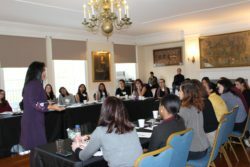 The WIL program is an intensive, nine-month-long women’s leadership development program for female Residents at International House, New York. Facilitated through the I-House Programs Office, the competitive fellowship program admits a select number of I-House Residents who display exceptional leadership qualities and the potential to become impactful leaders in their respective fields. 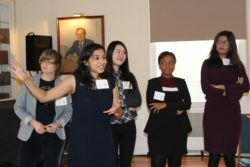 Through a series of workshops and seminars, WIL Fellows cultivate their personal leadership identity, cross-cultural competences, and professional skills. 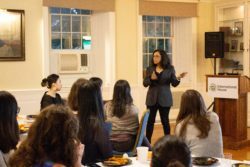 Over intimate conversations with invited speakers, WIL Fellows gain first-hand insights into topics women encounter as they advance in their professional journeys. Another highlight of the program is the close exchange Fellows enjoy with I-House Trustee Lauren States, who chairs the WIL Advisory Council. Fellows are coached by her on seeking out their own sponsors, who will advocate for them and champion their professional successes. Fellows also receive invaluable one-on-one advisement on improving their resumes and interview skills. At “WIL weekend,” as events like these are affectionately known, 24 Fellows rounded out the 2018-2019 cohort. One Fellow was Swathi Chandrasekaran, a Resident originally from India. For her, the WIL program has provided an immensely beneficial experience from the start. Swathi is currently a Master’s student in Management Science and Engineering at Columbia University. Back at the university in India where she completed her Bachelor’s degree, she had written a cover story for her campus magazine on a curfew system that applied only to female students. Her story caught the attention of the university’s senior administration and eventually led to the relaxation of the curfew. For Swathi, the WIL program has offered her the extraordinary opportunity to interact with diverse leaders from a myriad of industries in pursuit of her strong desire to improve basic education and women’s empowerment in India. Apart from attending personal leadership and professional skill development workshops, WIL Fellows commit a day in the Spring semester to community service. At the end of the program, the Fellows put their newly acquired leadership skills into use and organize a series of events for the I-House community as their capstone project. The planning process for the capstone project entails collaboration between Fellows of diverse disciplines and backgrounds, an aspect which has been rewarding to WIL Fellow Tatiana Neiman (USA). The WIL program is made possible through the support of International House donors and Bayer US, one of the world’s foremost innovators in healthcare and medical products, whose goals include promoting diversity and creating an environment which fosters more women leaders. With more than 400 graduates since its formation, the Women’s International Leadership program reflects these goals in alignment with the mission of International House to foster cross-cultural understanding in the next generation of globally-minded leaders. Yibing (“Bing”) Quek is a Ph.D. student and Research Fellow at Columbia University, where she studies the intersections between ethics and education, and the field of higher education internationalization. She relishes all opportunities to examine and converse on both contemporary and enduring education phenomena. Previously, she was part of the Singapore Government’s Public Service Leadership Program and led curriculum and policy projects at the Ministry of Education and Ministry of Communications and Information. She is also an advocate for literacy, learning and women empowerment, and is currently a Women’s International Leadership (WIL) Fellow at International House, New York. Follow Bing on Twitter @bingquek, and connect with Bing on LinkedIn.